It's been a while since I chatted with Nathan Head, my freaky fiends, and he is still one of my faves to not only interview, but to watch in all his splendeur effrayant. With roles ranging from terrifying clowns, psychopaths, demon possessed, the living dead, to a bit in a Dr. Who episode, Nathan has proven time and again in all his endevours what a great character actor he is. Nathan also has been one busy boy, and involved in some very exciting projects. Want to know how busy? Well, just continue reading and you shall see my pets! Lili's Lair: It's been several year since your first interview here. What's been your favourite project in that time, and why? 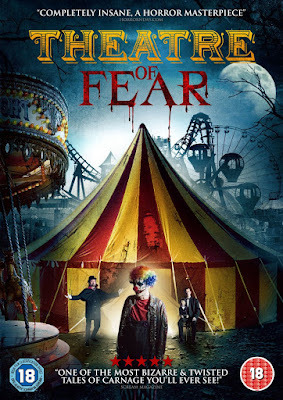 Nathan Head: Well there’s been a few, I’m exceptionally proud of Theatre Of Fear (aka The Midnight Horror Show), which came out in 2014 in the UK and 2015 in North America. It got a good release and was even in the UK DVD charts for two weeks and released in 3D in cinemas in Germany. But I also enjoyed working on that film too, I made some good friends and I’m back working with the same crew again soon on another project set in the 1940s, so that should be fun. Lili's Lair: How do you think you've grown as an actor over the last several years? Was there a specific person or event that helped you do so? Nathan Head: I have grown a lot over the past decade or so, I look back at some of my earlier projects such as Mark Macready and the Archangel Murders or Tuck Bushman and the Legend of Piddledown Dale and it’s refreshing how much I’ve improved as a performer since then, but I don’t think we ever stop learning or improving ourselves. I’m not sure if there is a specific person or event that has helped me grow over the years as an actor, but there are a number of film directors I’ve worked with who have helped me push myself more and discover more about my own abilities. 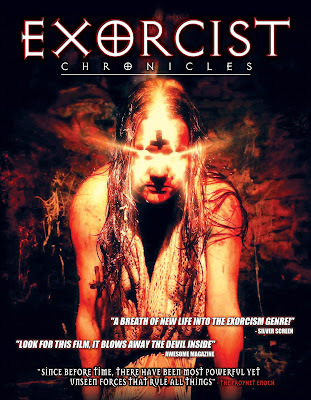 I did a film a few years ago called Exorcist Chronicles, for an American production company, and my role was quite physically demanding. I worked closely with a stunt adviser who’d previously worked on lots of British television shows, such as Marple and London’s Burning, and my scenes were with a guy who had also worked as a professional cage fighter in the past, so I had a lot of instruction from experienced guys for my scenes, which helped a lot. Lili's Lair: What's your favourite type of character to play? Has that changed since your last interview here? If so, how? ‘everyman’ though, I always prefer to play someone with some sort of variance to anything that I’ve done previously. That’s not changed much since 2009, but I think I’ve learned to choose my prospective offers much more carefully than back then (when I would just say “yeah, sure!” to anyone and everyone who approached me). Lili's Lair: You've also been doing the "con" circuit. What is that experience like? How do you feel that it's added to your marketability as a performer? 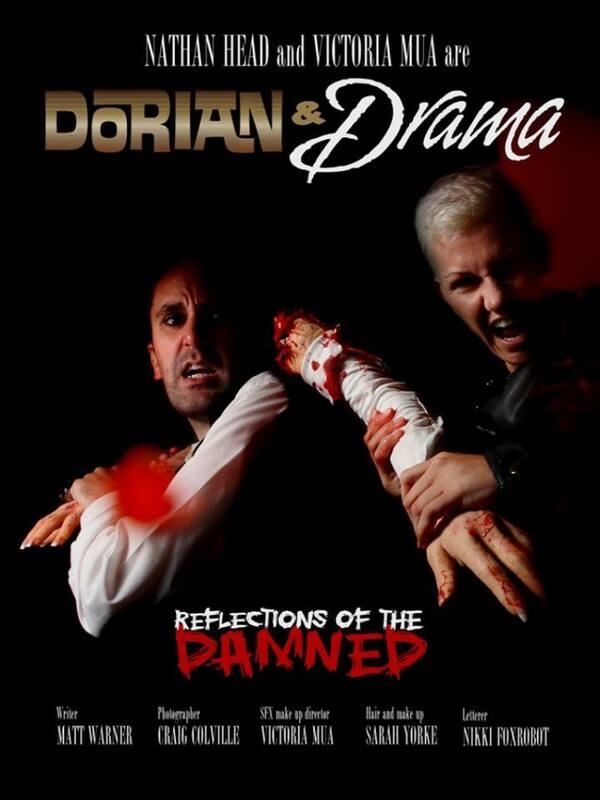 Nathan Head: Well I got started in the convention circuit via some friends at Hellbound Media who I’d known for many years, they write and publish horror comics and we eventually worked together on a photographic comicbook called Dorian & Drama: Reflections of the Damned, I play a failed stage magician who is putting on his comeback show in a haunted asylum. 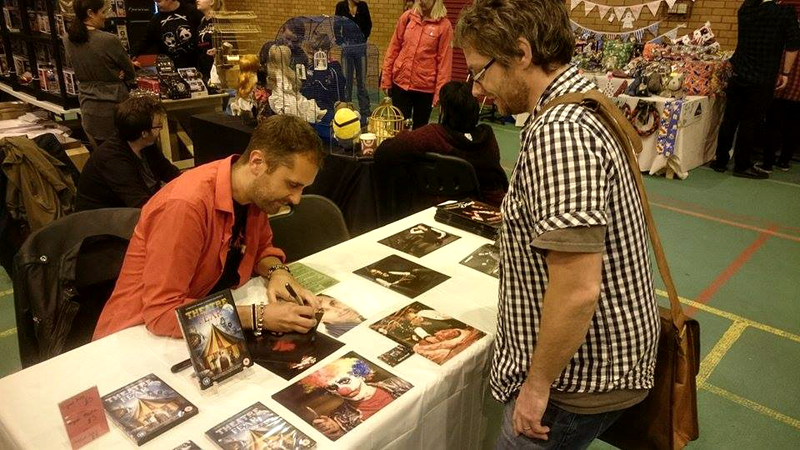 I’d go along with Hellbound Media to various Comic Cons across England and Wales to help promote the comic, as well as sign copies for any fans, and after a while I started to get offers to make appearances at other Comic Cons and Horror Fests as a special guest, which has been amazing. Surprisingly I’ve had a lot of fans of Doctor Who approach me at events because I had a small role in the 2007 Christmas Special, even though I’m hardly in the episode at all, people seem to remember my comic relief scene with David Tennant. Doing the con circuit has been a great tool for me as a performer because I’m able to promote any films I have coming out in the near future and also give the exclusive news of any projects I’m working on at the time, I think its important for any performer to get their face out there for people to see, it pays off to get your name out there, not only to meet potential employers and producers, but also meet the fans who appreciate the final product and are interested in your work. Lili's Lair: What projects do you have coming out? What are you currently working on? Nathan Head: I’m currently working on a duology called Blood Curse, its a film in two parts and I play a paranormal TV host called Tyson Knight who is helping out a family who are being haunted by a demon. 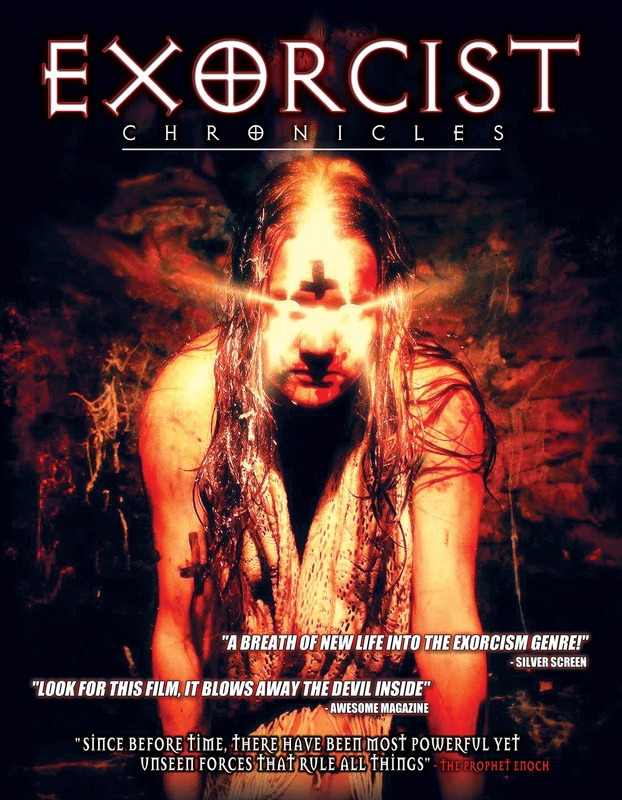 The Blood Curse films have been filming for some time now but the final few sequences are scheduled to be completed later this year, they’re pretty good so far and have all sorts thrown in there, levitation, demonic toys, blood rain storms. I’m also shooting a film this month with director Andrew Jones again, it’s called The Toy maker and it’s set during World War 2 with murderous puppets. I play a Nazi officer called Berger and that’s about all I can tell you right now, but hopefully more details will be public in the new year, nearer the release date. I have a few films coming out in 2017, there’s Ouijageist, where I play a window cleaner called Mark who comes a cropper when he finds a ouija board at a client’s house, the effects are brilliant in that film and I really can’t wait to see the finished movie, there’s also Blaze Of Gory, which also stars Emily Booth, I play a pub landlord who is kidnapping tourists in his beer cellar and harvesting their organs for cash, and hopefully Virus of the Dead should be out by 2017 (if not sooner). Virus of the Dead is a found-footage zombie movie and it has a pretty epic cast list, its also starring Clint Eastwood’s actress daughter Kathryn, Mhairi Calvey from Braveheart, Timo Rose, James Cullen Bressack, Shawn C. Phillips from Grave Encounters 2 and loaaaaaaads of other horror names who I am increasingly proud to be associated with. People should check it out. Oh and here’s a Lili’s Lair exclusive, I’m attached to a new scifi film that’s going to be shooting late next year, about an astronaut, the script looks great from what I’ve seen so far, I’m looking forward to starting on that. It’s going to be shot using physical models for the spaceship shots, which I always think looks AMAZING on screen. Lili's Lair: What would you like the future to hold for Nathan Head? Nathan Head: I get asked this often and I never know the answer. There are many directors who I would love to work with one day, I’d also like to work on an Asylum film one day, don’t ask why, it’s just on my “to do” list. Fingers crossed haha. I’d also like to work with the Soska Sisters one day, they’re a great pair and they are doing amazing things for the horror genre, so is Eli Roth and James Wan too. But who knows what the future holds for me. I’m just happy doing what I’m doing and whatever comes my way, will please me enough. I told you he was one creepy cat. Make sure to visit Nathan on line and see for yourselves.